The structure of atoms dictate their properties. 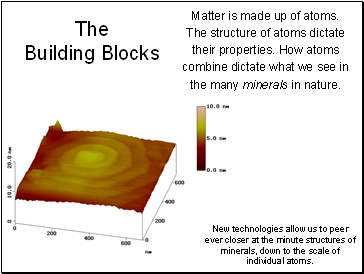 How atoms combine dictate what we see in the many minerals in nature. New technologies allow us to peer ever closer at the minute structures of minerals, down to the scale of individual atoms. Protons carry a positive electrical charge, electrons carry a negative charge, and neutrons carry no charge. Neutrons work to keep nuclei together. 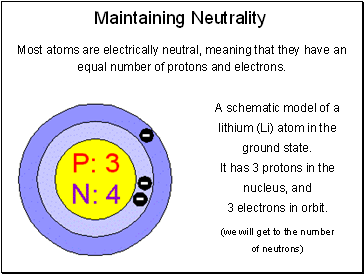 Most atoms are electrically neutral, meaning that they have an equal number of protons and electrons. A schematic model of a lithium (Li) atom in the ground state. 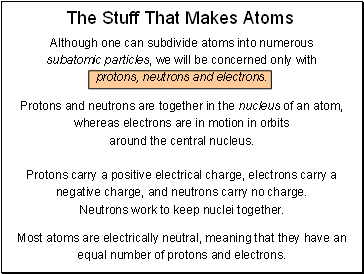 Properties of atoms reflect some combination of features related to electrons or to the nucleus. 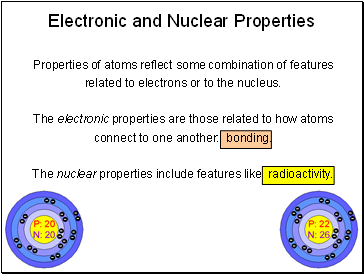 The electronic properties are those related to how atoms connect to one another: bonding. The nuclear properties include features like radioactivity. The number of neutrons tends to closely follow the number of protons. Atoms with more of each are bigger and heavier. 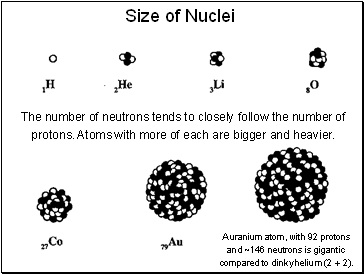 A uranium atom, with 92 protons and ~146 neutrons is gigantic compared to dinky helium (2 + 2). 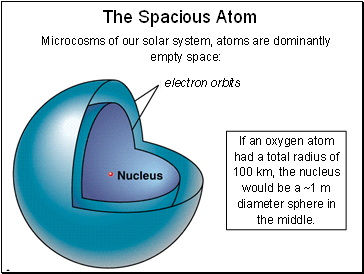 If an oxygen atom had a total radius of 100 km, the nucleus would be a ~1 m diameter sphere in the middle. In a simplistic model, electrons float around the nucleus in orbits that are sometimes called shells. As the number of electrons increases, they start to fill orbits farther out from the nucleus. In most cases, electrons are lost or gained only from the outermost orbits.